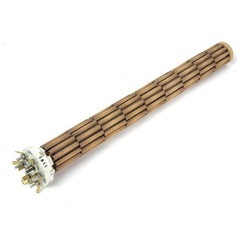 Delhi based exporter and manufacturer offers Porcelain Heating Element where the entire manufacturing process is subjected to a stringent procedure and each level of the production is carefully monitored by our Q Cs. An exclusive range of superior quality Porcelain Heating Element is offered by us to match up with the increasing demands of the market. These heaters are of replaceable type and are highly suitable for various applications that include oil heating, geyser, chemical and water heating. 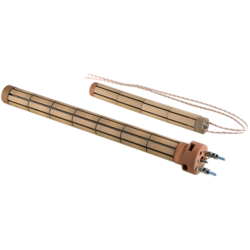 Our range of Porcelain Heating Element is made out of Open helical coils of high resistance wire and is covered with fluted refractory bobbins. 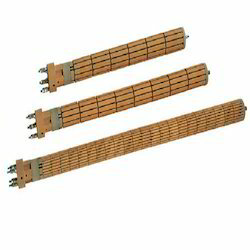 We are offering a wide range of Porcelain Heater which are made with high temperature bearing insulators. Elements in these heaters are exposed partially in air for better transmission of heat. Mostly used in ovens and tanks where draining is not possible to change the heaters.